From LaGrange to Crestwood to Louisville, families recommend us as one of the most trusted children’s dentists in Oldham County, and we can’t wait to help your child on their journey to a beautiful, healthy smile. At Floss 32 we believe your child’s dental visit should be relaxing, informative and most importantly fun! 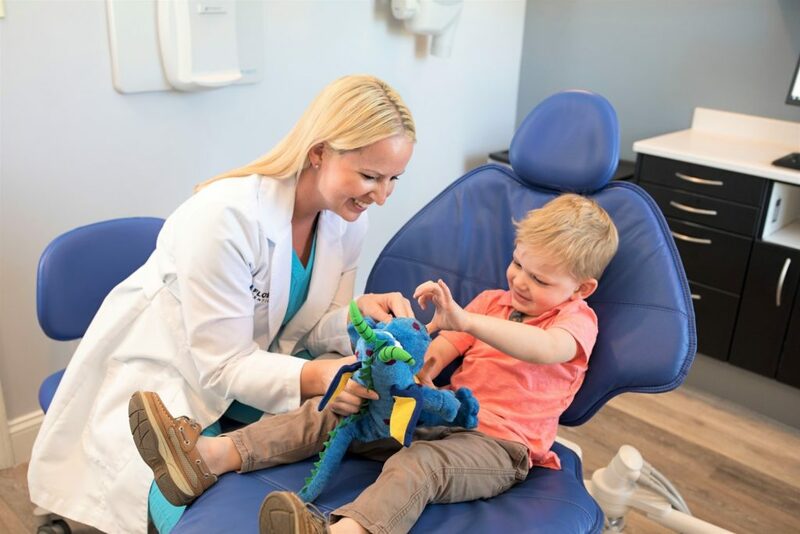 From a playroom filled with toys to flat-screen TVs with your child's favorite show, Dr. Brittany Lynn Holeman and Dr. Adam Weisenbarger do everything possible to make visiting the dentist an enjoyable and stress-free experience. The American Academy of Pediatric Dentistry recommends that every child should start seeing a dentist around 1 year of age. As soon as the teeth erupt they are being exposed to bacteria, sugar, and acid that can all lead to tooth decay. The first visit not only checks to see the health of your child's teeth but it also allows our knowledgeable Dentist to show you and your child how to properly take care of them. How do I prepare my child for their first visit to the dentist? Dr. Brittany and Dr. Adam know that going to the dentist can sometimes be a bit overwhelming, especially when it’s a child’s first visit. 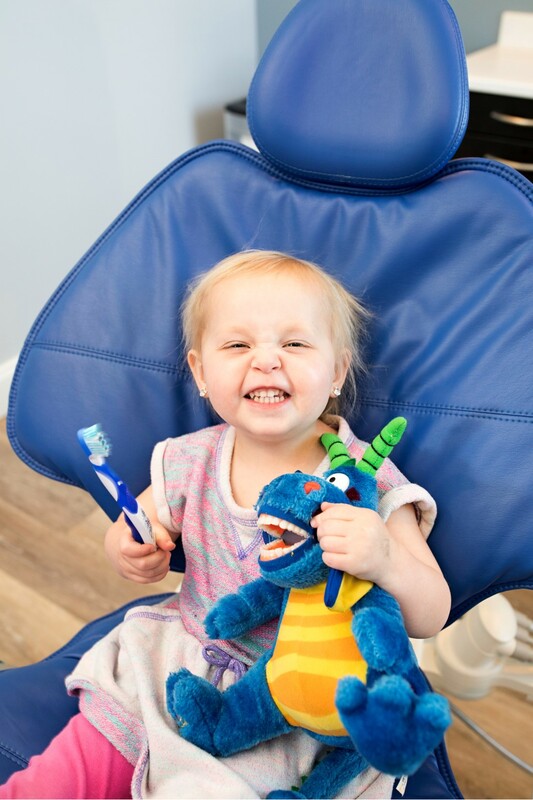 This is why our compassionate Crestwood dentists take their time welcoming your child and making sure they are comfortable before we begin any procedure. When preparing your child to visit our office, try to remain relaxed and calm. You may want to read a book about a first dentist trip or watch a cartoon about the experience together. Avoid using words like “needle” or “hurt” and instead talk about what the dentist will do in a positive manner. 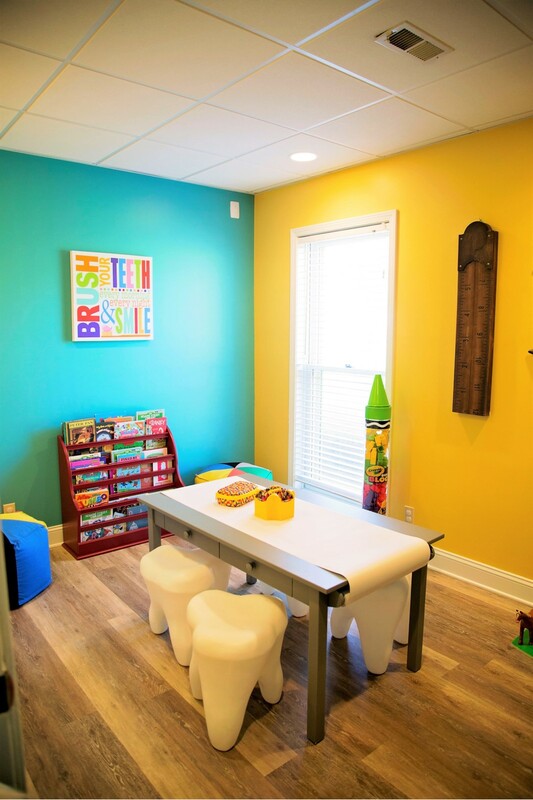 You can say phrases like “The dentist is going to count your teeth” or “You get to show the Dentist how good you are at brushing your teeth!” Inform your child that they get to enjoy our playroom filled with toys and art supplies. Let them know that they can pick their favorite show to watch as they sit in the “special dentist chair”. Above all, it’s important for both you and your child to know that Dr. Brittany and Dr. Adam will never “push” your child past their comfort zone on their first visit. We believe the first visit sets the tone for the rest of their dental health and we will do everything to make it a positive and even enjoyable one! How often should my child see a kids dentist? After your child’s first dental visit we usually recommend your child having an examination and cleaning every 6 months. However, based on your child’s specific dental needs Dr. Brittany or Dr. Adam will recommend a schedule tailored to your child to help optimize their dental health. You can start good oral care for your child’s mouth even before their first tooth erupts. Use a soft moist washcloth and wipe down your child’s gums twice a day, or at least in the morning and after feeding. This way you’ll not only be making sure the gums are healthy for the incoming teeth, you’ll also get your child used to the brushing motion. Once the first tooth has arrived it is important to begin brushing. You should choose an extra soft brush with a small head and a large handle. Take a pea-sized dot of fluoride-free toothpaste and brush your child’s teeth and gums gently. It is important to continue to use fluoride-free toothpaste until your child is old enough to brush without swallowing the toothpaste, usually, this occurs around age 3 or 4. Should my child use Fluoride Toothpaste? Fluoride is a great addition to optimizing good oral health. It can help keep teeth strong and even remineralize areas in the enamel where the structure has started to break down. Although fluoride is great for teeth and a safe to use daily, it can cause an upset stomach if swallowed in large quantities. This is why we recommend using fluoride free toothpaste until your child is old enough to brush their teeth without swallowing the paste. This usually occurs around age 3 or 4. Diet is a large part of your child’s oral health, and you can help them make smart choices when eating and drinking. For infants, it is vital to make sure they don’t go to bed with a bottle of milk -- only water. When they’re older and eating solid foods, give them a smart teeth-friendly diet. Sugary drinks and sticky foods should be kept to a minimum and offered with a meal, not as a snack throughout the day. Offer healthy options like fruit, cheese, and vegetables as snacks rather than carbohydrate-loaded goodies. Avoid lollipops, Jawbreakers, Laffy Taffy, and other long-lasting sticky candies that can continually coat the mouth with sugar, since this increases the risk of cavities. A Dental sealant is a thin white coating that is applied to the chewing surface of the back teeth. The sealant is simply brushed onto the grooves of the teeth and prevents food and bacteria from getting into your child’s teeth. The whole procedure is quick, painless and safe, it helps guard against cavities, especially for the teeth that are hardest to reach. Why does my child need X-rays? Are they safe? Dental radiographs, more commonly known as X-rays, are used to detect numerous oral health problems that may exist in your child’s mouth. This includes dental cavities, nerve or root infections, missing or unerupted permanent teeth, and much more. At Floss 32 we use digital radiography, which features 80% less radiation compared to traditional film-type X-ray machines. This helps make X-rays easy, quick and safe for children.